CBD derived from Industrial Colorado Grown Hemp. 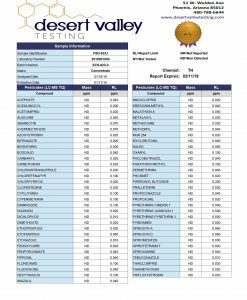 Are you here because you have questions about vaping CBD oil? You’ve come to the right place! If you’re wondering why you see so many people these days with a CBD oil vape pen, know that there’s a good reason for it. We’ll explain all you need to know about using a CBD vape pen. When you’re ready, you can buy CBD vape oil directly from our site! Vaping or ‘dabbing’ is the process of consuming CBD through a cigarette-like vape pen. Studies prove that vaping is at least 95% safer than smoking! It combines portability and vapor into one manageable device. Brighten up your day with a CBD vape pen, which contains the maximum amount of CBD without any artificial flavors. It is convenient for all your CBD needs. Plus, you can use it at any time. THIS PRODUCT IS FOR CUSTOMERS 21 OR OLDER ONLY. You should do your research and see if vaping CBD oil may be able to help your condition. Consult your physician if you have a medical condition or are taking any medications before using a CBD vape pen. 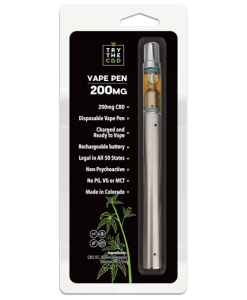 The CBD oil vape pen comes ready to use! There is no need to charge it. It is good for up to 100 puffs. 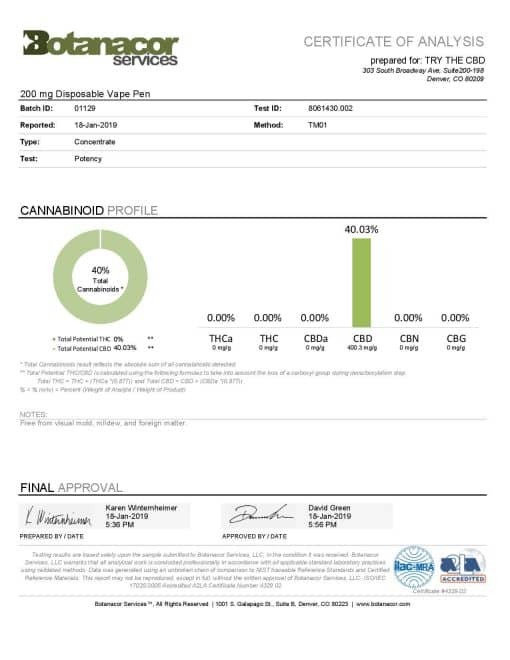 You can buy CBD vape oil from TryTheCBD.com. Using a CBD vape pen allows you to relax easily and discreetly. THIS PRODUCT IS FOR CUSTOMERS 21 OR OLDER ONLY. You should do your research and see if CBD Oil can help your condition. Consult your physician if you have a medical condition or are taking any medications before using CBD oil vape pen. Many customers buy a CBD Vape Pen but then do not configure the dosage correctly. Of course, an incorrect dosage will mar the experience and is likely the primary reason why CBD vape oil is not working for you. Also, you should research different dosages to understand the effects. Moreover, I know what to be looking for. Vaping cannabidiol (CBD) products are one of the best ways to take advantage of their benefits. Why? We’ll explain in this section. CBD is a non-psycho active cannabinoid, offering reported benefits in combatting anxiety and depression, inflammation, pain, seizures, and more. People often choose CBD versus THC when they want to help their bodies without experiencing a high. Getting high can be unsettling, uncomfortable, and inconvenient for many people. When you smoke or vaporize it, though, CBD bypasses this first pass effect, delivering the result you desire much faster and more efficiently. As we shared above, vaping CBD oil helps offset the loss of bioavailability. Of course, you will also experience the effects of CBD much faster and can consume less product overall. Within that study, 59 percent of consumers said that vaping is their preferred consumption method. CBD is popular. Vaping is a favorite way to consume it. So, what we offer here is simply the best way to get it done. What is the best delivery system for CBD rich cannabis? It’s the one that provides the right dose, for the correct duration, with the fewest unwanted side effects. Are you looking for a CBD oil vape pen with other terpenes? We have them! See our strain wheel below for an introduction to all the terpene strains we have on offer. On heating, propylene glycol and polyethylene glycol can produce carbonyls. These, including acetaldehyde, formaldehyde, and acrolein, may be toxic to the user. 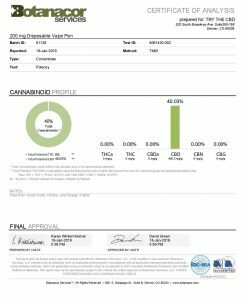 In a 2017 study by the Medical Marijuana Research Institute, researchers heated and tested these carrier liquids, along with MCTs and vegetable glycerine, for carbonyls. The study found propylene glycol produced high levels of acetaldehyde and formaldehyde when researchers heated them, compared to MCT and vegetable glycerin. Acrolein production was similar for all substances. The study also found that MCTs produced a small amount of acetaldehyde; about 33 times less than polyethylene glycol. Why do we NOT use PG or VG in our vapes? To learn more about the safety measures we take for our products, read on. 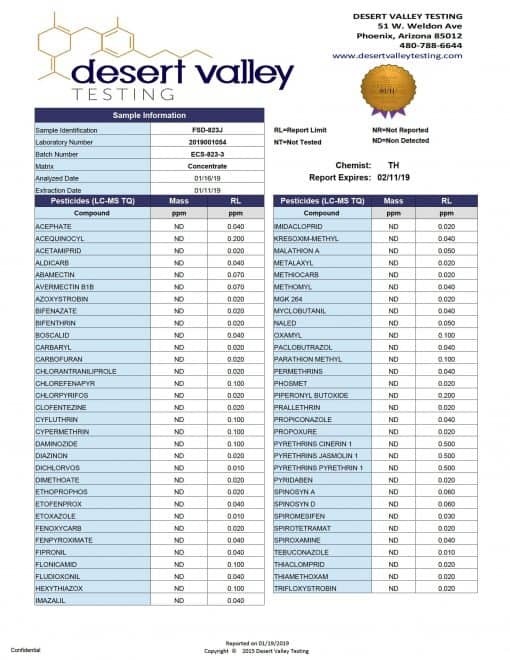 There are certain substances we do not use in our CBD vape oil for safety and health reasons. 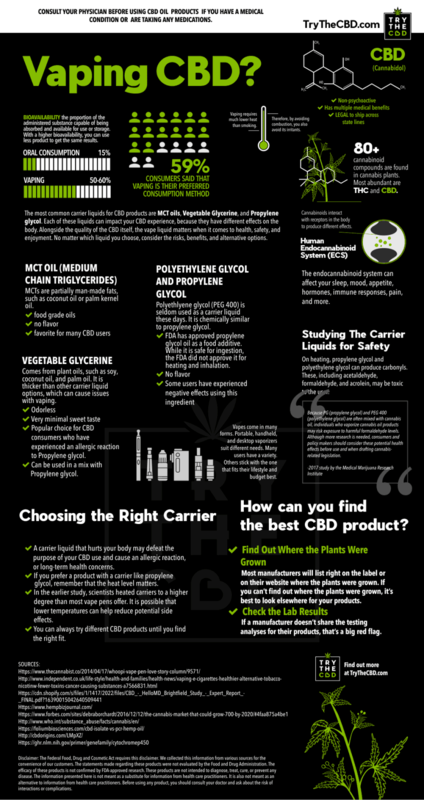 Propylene glycol and polyethylene glycol are likely the most controversial CBD carrier liquids. Polyethylene glycol (PEG 400) is seldom used as a carrier liquid these days. It is chemically similar to propylene glycol. The FDA has approved propylene glycol oil as a food additive. While it is safe for ingestion, the FDA did not recommend it for heating and inhalation. It was flavorless and used in many vape oils, but some users have experienced negative effects using this ingredient. For example, propylene glycol can absorb moisture and leave users with a dried out mouth or throat. Also, an allergic reaction to propylene glycol is also possible. Allergic users could experience persistent muscle pain, a sore throat, a rash, night sweats, or diarrhea. For this reason, some users find that it wears out the vaporizer faster than other liquids. The thicker liquid may lead to a faster build-up of residue in your vaporizer. Plus, it can take longer to heat. And it may require a higher temperature to vape effectively. 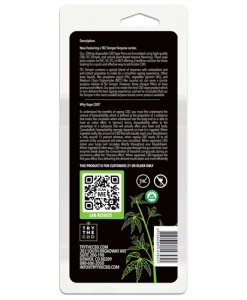 It is also a humectant and can introduce the same drying issue as propylene glycol. However, vegetable glycerine is a popular choice for CBD vape oil consumers who have experienced an allergic reaction to propylene glycol. Some CBD vape oil consumers prefer a mix of propylene glycol and vegetable glycerine. This allows them to get the best of both liquids. A mixed liquid balances flavor, vapor density, and ease of use.